We have another Friday with a new Blue Rose release and it’s a very special one: For the first time in the label history an album is only available in the digital format and only available on CD at the band’s shows in Scandinavia and the UK in April and in the fall at their upcoming German tour – THE BLACK SORROWS are back with the live album Live At The Palms, recorded on October 26, 2018 at „The Palms At Crown“ in Melbourne, Australia. The album contains features nine songs, seven taken from the band’s latest studio release, Citizen John. The remaining tracks are covers by The Coasters („Down Home Girl“) and „The Honeydripper“ by Joe Liggins & The Honeydrippers. Live At The Palms is now available at European download and streaming sites. 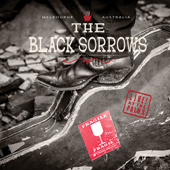 Kommentare deaktiviert für THE BLACK SORROWS are returning with a live album!